Seller: caracalla10 (8,161) 100%, Location: Bavaria, Ships to: Worldwide, Item: 142958519613 4 Celtic Ancient Glass Beads, 300 - 100 BC., VERY RARE !! 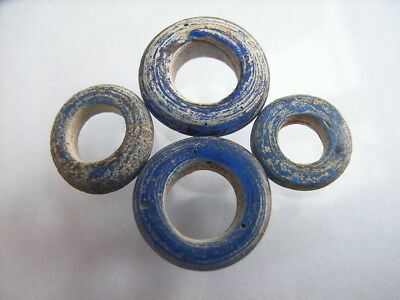 You are bidding on 4 original Celtic Ancient Glass Beads, dated to 3rd - 1st Century BC. Wearable; these beads need re-stringing to be a part of a modern beautiful necklace. Diameter of these beads: 10,5 mm - 14 mm. Intact beads. VERY RARE !! VERY GOOD QUALITY !! Former German private collection. You are buying the same beads in these pictures. Authenticity guaranteed. I will combine shipping; you pay only the shipping cost for the first item; rest is for free. Shipping costs: worldwide by registered letter 5,00 US Dollars or 3,50 Euros. And now good luck for bidding !!! Popularity - Very high amount of bids. 1 views, 0.0 views per day, 199 days on eBay. Normal amount of views. 1 sold, 0 available. Very high amount of bids. 1 views, 0.0 views per day, 199 days on eBay. Normal amount of views. 1 sold, 0 available.